Recently, surprised researchers discovered that a 2,300-year-old mummy that was once believed to be the remains of a hawk is actually a human fetus. Their estimation of the age of the fetus meant the Maidstone Museum helds the youngest mummified human remains found to date. The research team was also shocked to find that a mummy known as Ta-Kush, believed to be a 14-year-old girl when she died 2,700 years ago, was much older. Kent Online reported in 2016 that the researchers had used CT scanning to discover that a tiny sarcophagus which was thought to hold a hawk is really a miscarried 20-week-old fetus from the Egyptian Ptolemaic period (323 BC – 30BC). The researchers also used the same technology to discover that a mummy named Ta-Kush was at least in her mid-20s when she died, not her early teens. Technology used to perform unintrusive scanning is being updated almost as fast as cellphones are updated. Following on from the original discovery, new micro-CT scanning from Nikon Metrology (UK) has now been employed on the fetus formerly known as ‘Hawk Mummy’, and it has revealed previously unimaginable detail of the fetus. It is now known to be of ‘a male, stillborn at 23 to 28 weeks of gestation, and with a rare condition called anencephaly in which the brain and skull fail to develop properly.’ as revealed by a press release from Western University , Canada. Lead examiner, Andrew Nelson, in consultation with a multi-disciplinary team of analysts, has now provided a detailed description of the slightly-older-than-previously-thought fetus, from what is now ‘the highest-resolution scan ever conducted of a fetal mummy.’ according to the report. This is one of only 2 mummified individuals discovered to have suffered from this condition, the other having been described in 1826. Ta-Kush has also been called ‘The Lady of the House’ and the daughter of Osiris - god of the afterlife. The young woman’s mummy was brought to England in the 1820s. Before analysis began on her remains, the mysterious mummy was already one of the most popular sights at the Maidstone Museum. The researchers hope that their work will help to fill in more blanks about her life and death. A collaboration of researchers from Liverpool John Moores University, KIMS Hospital, the Heritage Lottery Fund, Maidstone Museums’ Foundation, the Egyptology Department at the British Museum, the Petrie Museum at University College London, Western Ontario University, and the Egypt Exploration Society have been working on the CT scanning project. 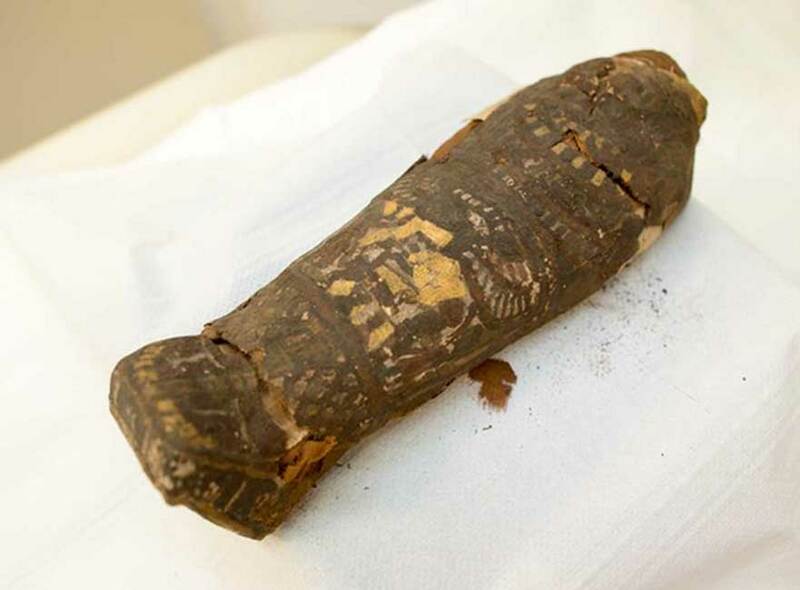 The research team also scanned other artifacts, such as an ancient Egyptian ram’s horn. The scan results of the horn are puzzling: they found the object was stuffed with mummy linen and items including a necklace and some buttons which date to the Victorian age and later. The mummies and other artifacts which are being studied are on display in a larger Ancient Egyptian and Greek World collection at the Maidstone Museum.